Discussion in 'Buy / Sell / Trade - Other' started by flightcancled, Sep 27, 2010. Need to clean out my closet, and since I quit completely I need to get my gear to a better home. Before you look at anything I must give you a disclaimer: It has been years since I have even looked at this stuff, let alone aired it up or even played with it. I do know that it all worked 3 years ago (unless noted), but expect that anything you buy needs some love before it can go on the field. -polymer frame "same design as a stock frame"
-stock body "spray painted silver"
-and blue hybrid lady grips. 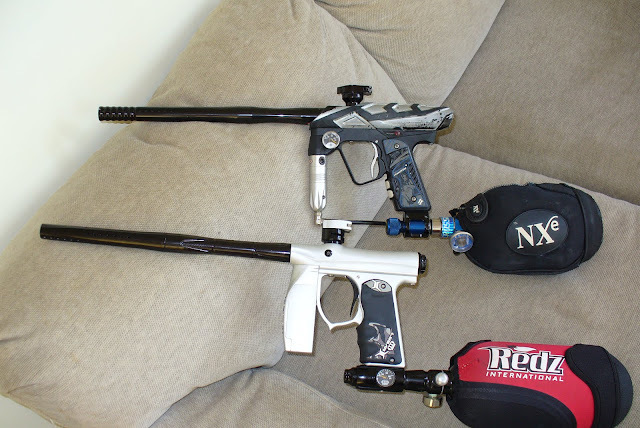 Once again, have a ton more stuff, hoppers, clothing, ENDLESS AUTOCOCKER PARTS, etc ask me if I have it. rcsteele, Swank, MMLT1995 and 1 other person like this.